Columbia on the back foot Senegal pressure on. So turns out Senegal CAN play good football. What they did the first 75 minutes was brutal. Can't believe Senegal are out now too. Gutted for them. Didn't deserve that at all. Senegal out on the fair play rule. I guess the bright side of Senegal's elimination is to have Mane back sooner rather than later. I watched the game and they did not deserve a point from today's game. Just shameful, time-wasting performance until they went down 1-0. What is this rule? thought it'd be goal differential. Same goal difference. Same goals scored. Japan should be out on the basis that they played vs 10 Columbia players for 85+ minutes. One of the stupidest posts I have seen. Nobody would make such a stupid rule. It is not Japans fault that Columbia deserved a red. I watched all the Japan matches and they played well. You can't take this away from them. They deserve it. As for what people said about Senegal, time wasting until 1-0 down? You have sympathy for that? Coming from you that is funny Rib! What I'm saying is, Japan had it easier. The Yellow card idea is a nonsense. I expect in future every yellow card to be checked by VAR... as it turns out, they are a tournament decider. Senegal were wrongly denied a penalty through VAR. They don't deserve to be out at all. What I'm saying is, Japan had it easier. I don't know if you are posting stupid things to just get a response. Japan had to play Columbia, Senegal and Poland. Out of the 4 teams they were deemed to have done the 2nd best. The yellow card rule may seem stupid, but a lot of teams defending pick up yellow cards.. sometimes on purpose to stop an attack. These are called tactical yellows. There is probably room for using shots on target if goal difference is the same and if shots on target are equal then use cards, but I don't for one second think Japan don't deserve it or Japan had it easier. As I said, Columbia took down a Japanese player when they could have scored to get that red, you are basically saying Japan couldn't beat Columbia with 11 men without a single shred of evidence. Yes, they all played the same teams. Quite genius of you to point that out, as I hadn't realised it myself.. But Japan did play Columbia with a significant advantage for almost the whole game. Yes, it was Columbia's own fault. But that aside, Senegal are a much better team than Japan and deserved to go through. Poland did not even try after their goal. Japan strolled around the pitch. Real football did not put them through. Senegal are a much better team than Japan and deserved to go through. Senegal are not much better than Japan. They only beat Poland because of an own goal. Japan had more shots on target than Poland today too. Senegal were trying to time waste a draw and got punished. I would say Brazil, Croatia, Portugal etc... are much better than Japan, but Senegal? Are you having a laugh? If they are better and that is a big if, it is marginal. Stop fishing with images you found from Google you unimaginative fustilarian. Rib, you've made your entire LFCReds career on posting stupid sh*t in order to get a response...no fishing here..that fish was caught a long time ago. Career? What a stupid word to use for a forum membership. 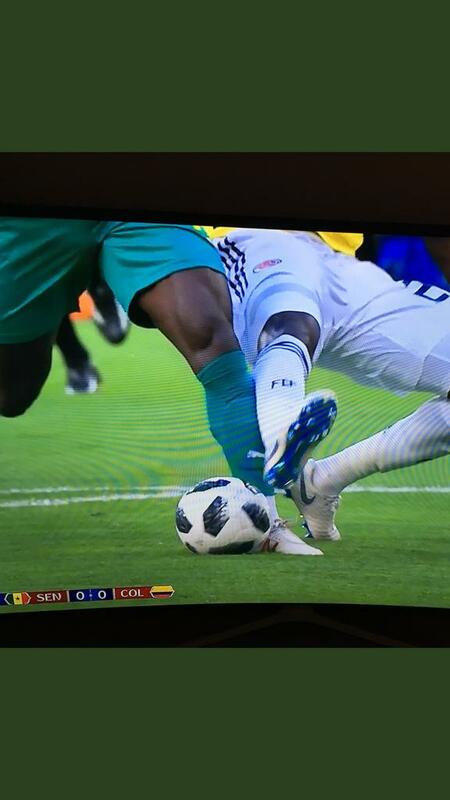 Seen that on the replay on BBC earlier if that still was to carry on in motion, the Colombia player gets a touch on the ball, it's actually a good challenge.